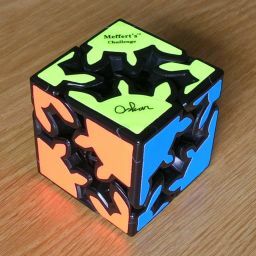 Gear Shift is a cube-shaped puzzle invented by Oskar van Deventer. The cube consists of eight corner pieces that are gear-shaped. Four corners have large gears with 8 teeth, the other four have small gears with 5 teeth, and they are arranged such that every pair of adjacent corners is one large gear interlocked with one small gear. Therefore when you twist one corner, all large gears twist in one direction and all the small gears in the other. You can also pull apart the puzzle along any of the three axes so that the gears of two opposite faces become independent systems. In this way you can twist the four interlocked gears in any face independently of the rest. The four large gears have 8 positions each, and the small ones 5 positions. This gives a maximum of 8454 = 2,560,000 positions. Each corner can be moved independently of the others, but there is a parity constraint on the large gears. The total amount that large gears have twisted is always even. Although the small gears also move an even amount in total for every move, this does not restrict them because they have an odd number of teeth - an even distance in one direction is the same as an odd distance in the opposite direction. The large gears have an even number of teeth, so there there the parity of the total amount that they twist remains constant. This means that only 1,280,000 positions can be reached. This puzzle is like Lights Out and especially Rubik's Clock, in that the order of the moves does not matter. Therefore it can be solved in the same way as those puzzles using linear algebra. This puzzle is a little trickier than those due to the fact that the gears have different numbers of teeth (so it is best to split it into two independent puzzles and then combine the results with the Chinese Remainder Theorem) and due to the parity constraint on the large gears. I will not expand on this any further, except to note that such an analysis shows that it is always possible to solve the puzzle using no more than only 4 moves (3.6032 on average). Look at the picture below. It shows all the ways in which the two small corners of the yellow face can be twisted in opposite directions (one clockwise, the other anti-clockwise). Notice how their yellow facelets almost seem to face the same direction. I'll call these corners balanced. The large gear corners can similarly be twisted in a balanced manner in eight different ways. Split it into left and right halves, and turn them until the bottom face is correct. Turn the top face gears until big corners are balanced, that is to say they are twisted equally far away from being solved, but one clockwise and the other anti-clockwise. Twist the large top face corners another whole number of turns until the two small corners are balanced too. Turn the front face gears until the top two corners are correct. Now twist the left and right faces separately until they are all correct. The method above uses 6 moves, but if you were given the same position again then you could also solve it in 4 moves by combining those of step d with step a.